With summer whispering in my ear, I’ve begun happily putting the screens back on the windows, pulling out the barbecue and digging out my flip-flops. We spent this past long weekend in the sunny Methow Valley, and even though we came back to rain I still have warm days on my mind. And warm days call for something refreshing to sip, such as a shrub. Shrubs date back to the Colonial days in America, when vinegar was used as a way of preserving berries and other fruit. 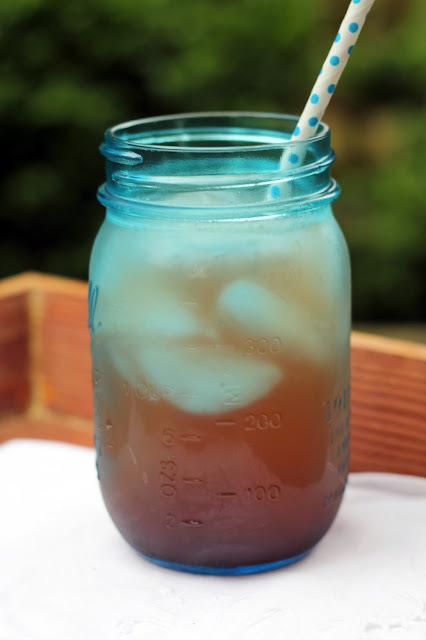 The fruit-and-vinegar syrup was mixed with seltzer and became a popular drink. I grew up in Lexington, Massachusetts, and colonial wisdom such as this is near and dear to my heart. Discovering this traditional beverage sent me into the kitchen, excited to try my hand at it. Making shrub syrup is quite simple and, since I chose to make a cold processed one it does not involve any cooking. Fruit is mixed with sugar and left to macerate for a couple of days, and then the resulting juice is mixed with vinegar. Dark red cherries are spilling over in the markets now, and I began thinking about how good their sweet, juicy flavor would be in a shrub. 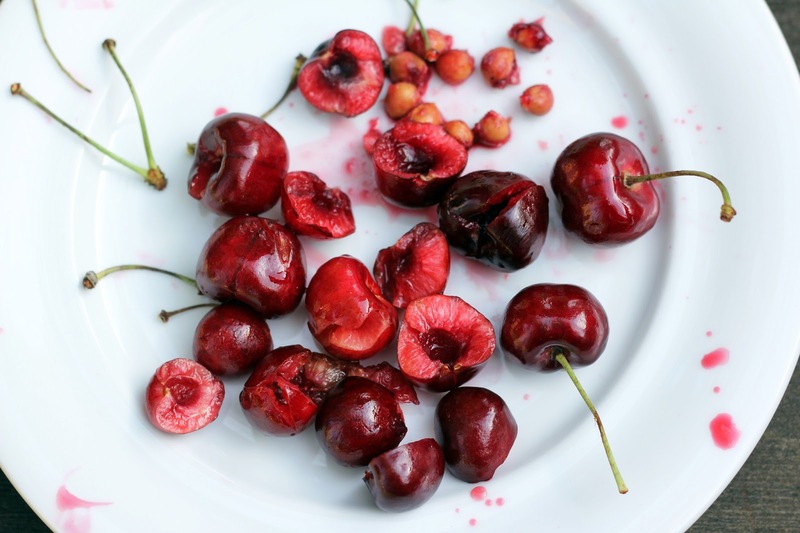 Remembering to don an apron (messy business, this cherry-pitting), I gently mashed pitted cherries with coconut sugar and then muddled some fresh mint for an herbal note. After a couple of days in the fridge, I drained the juice and stirred in some cider vinegar. Since cherries and balsamic pair so well, I added a touch of that, too, and was pleased. 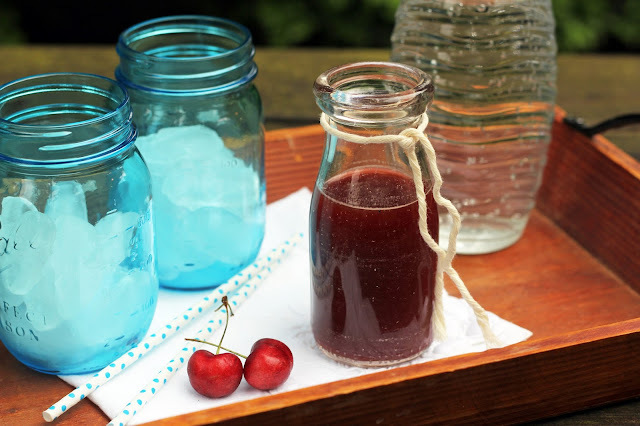 I loaded up a tray with jars, ice, a bottle of seltzer and my cherry mint shrub to mix drinks outside. A splash of shrub syrup, topped off with bubbly seltzer, was pure refreshment. The first sip was a bit bracing from the vinegar flavor, but then I settled into the tangy, fruity, unique flavor that is a shrub. As my ice cubes gently clinked and melted, I sank back and savored cherries in a whole new way ... and began listening for more summer whispers. Place the cherries, mint and coconut sugar in a bowl and gently mash (I used a pastry cutter). Cover the bowl and place in the fridge to macerate for 2 days. Place a fine mesh strainer over a small bowl and pour the cherry mixture through. Press to release as much juice as possible. Save the solids to stir into yogurt if desired. Add the cider and balsamic vinegar and stir until well combined. 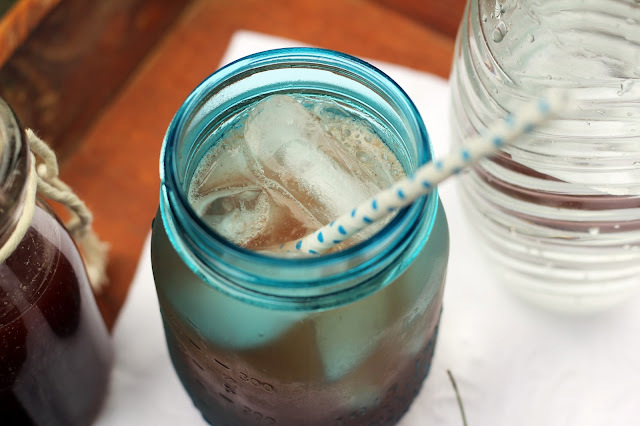 Pour a splash (or two, depending on taste) into a glass, top with seltzer and ice and serve. Store any unused shrub syrup in the fridge. Love shrub's, the cherry and mint is such a great combination. It looks so refreshing and delicious. This reminds me that I need to start making shrubs. Thanks, Suzanne! I've enjoyed drinking shrubs and am happy to have made one now. With berry season ahead I know I'll be making many more! They are so refreshing for summer, and I discovered the shrub syrup is also terrific in champagne for a brunch! 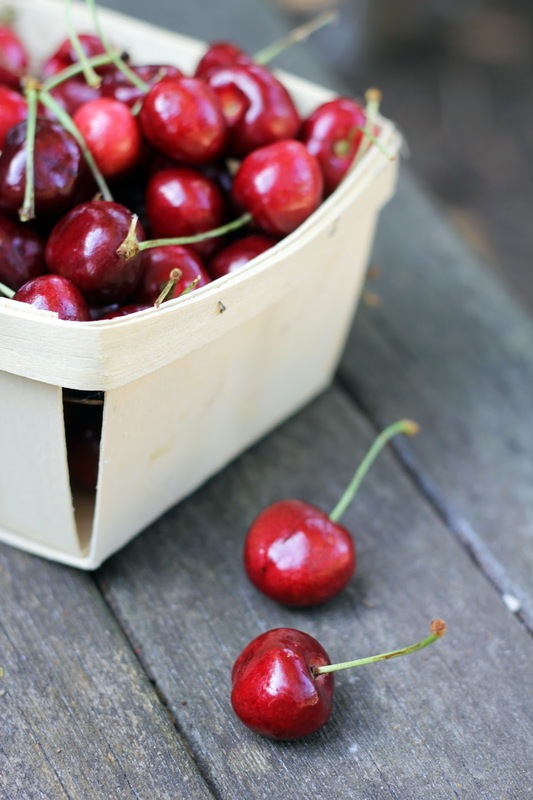 I love cherries. Such beautiful photos. Great flavor combos. Thank you, Amanda! I'm happy it's cherry season - lots of snacking going on here. Nice post! By coincidence I was busy reading about alcoholic shrubs last night (cocktails). These were also quite popular in the 1700s, although they substituted booze for the vinegar. I really need to make both varieties, don't I? ;-) Good stuff - thanks. Thank you, John! Oh yes, definitely need to make both varieties...I think I do, too! I have never had a Shrub before Hannah - thanks for introducing me to something new! My pleasure, Alyssa! I think you'd like a shrub. Making them is also appealing in a fermenting/preserving sort of way. Love an utterly satisfying mocktail....thanks for the inspiration! And what on earth do you need screens for here? That's the beauty of the NW. No bugs! Hi Alex! Oh wow, lots of memories of Shirley Temples...I may have to look for some grenadine syrup. Sounds like a fun one for summer! Thank you, Susan! Sarah makes excellent shrubs - I want to try some of hers. And isn't coconut sugar wonderful? It's become my go-to, as well. haven't had a shrub before, something fun and new to try! What cocktails have you made with this? I am looking for ideas that only use beer and wine, not hard liquor....ideas? I like to mix shrubs with something sparkling like prosecco or cava. It makes a nice alternative to a mimosa, too. I hope you enjoy it!